If you ever bought yourself or your kids a remote-control car, you'll know how quickly people get bored of them, leaving the toy tossed to one side. However, if you were looking for a small Ardunio project, that abandoned RC car might come in handy. 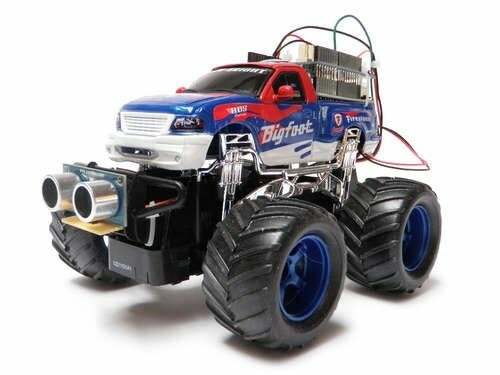 Randy Sarafan, who also happens to be the Technology Editor over on Instructables, gutted a remote-controlled car and swapped the parts for an Arduino board. Seeing as Arduino is good for controlling motors and sensors, Randy added a PING ultrasonic sensor to the front of the vehicle too. So in addition to driving back and forth, the toy car will now be able to register an object and stop before it crashes into it--a pretty handy ability if your kids have a habit of smashing it into stands with your finest china on top. As Randy points out in the video below, by giving the toy an Arduino, you've not only breathed a little bit of life into an old product, but you could tinker with this further--for instance, you could scrap the need for a remote altogether, and use the sensors to make the car follow you around. Still, for those looking for a small confidence-boosting task to do with that new Adruino starter kit, this brain-swapping project would be an ideal start. To know how to take the RC car apart though, or see which parts you're going to need, head over to the toy's Instructables page.